A baseball fan was struck in the face by a flying bat and carried from the stands on a stretcher on Monday night. 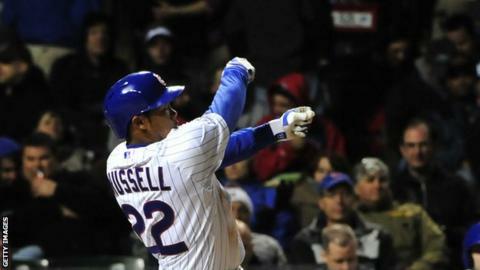 Chicago Cubs rookie Addison Russell's bat flew into the seats at Wrigley Field after he lost grip mid-swing. The fan suffered a cut, but was conscious and communicating before being taken to hospital by ambulance. "Whenever the bat was in mid-flight, I was screaming 'Watch out! Watch out!' Then, I saw the dude's glasses fly and it just wasn't pretty," said Russell. "It just slipped. I was aggressive, I saw a fastball, wanted to hit it and the bat slipped, and then I saw it just connect with his face. I felt so bad. "Words can't describe how bad I feel. If you see that guy out there I'm willing to give him a bat and sign it and everything. I just feel terribly bad about that." The Cubs went on to end the Pittsburgh Pirates' five-game winning streak with a 4-0 victory.